One among the expected side effects of global warming is a global increase in sea level, or sea level rise. Sea levels are expected to increase for a number of reasons, including melting ice and the fact that warmer water occupies a greater volume. This is expected to affect low-lying land areas along coasts, including river deltas and barrier islands. Sea levels have varied substantially over time. 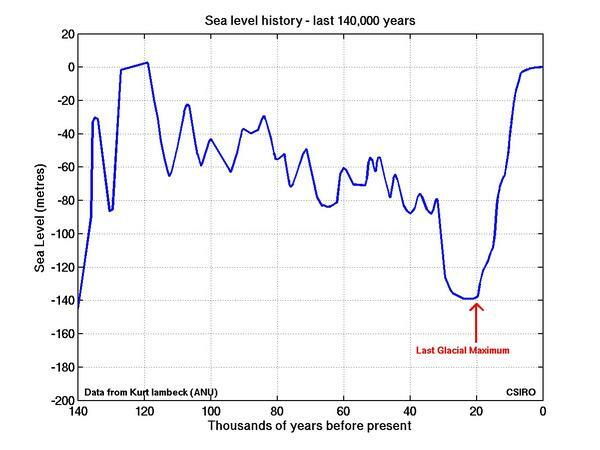 The CSIRO report on Historical sea level changes includes this graph. Also see our Cryosphere page for the physical mechanisms of ice. CU Sea Level Research Group, University of Colorado. According to the NRC climate stabilization targets report, global sea level has risen by about 0.2 meters since 1870. The sea level rise by 2100 is expected to be at least 0.6 meters due to thermal expansion of the ocean, and melting of small ice caps and glaciers. However, ice loss is also occurring in parts of Greenland and Antarctica. If all the ice in Greenland were to melt, it would cause an additional sea level rise of 7.2 meters—and if all the ice in the West Antarctic Ice Sheet were to melt, it would cause a further rise of 4.8 meters (see below). However, the amount of sea level rise in the next century remain uncertain, because the rate of melting of these bodies of ice is hard to predict. The 4th IPCC report, back in 2007, took a conservative stance and assumed that the Greenland and West Antarctic ice sheets would melt at a slow and more or less constant rate until 2100. Their conclusion was that about 75% of sea level rise would be caused by the oceans expanding as they warmed. The melting of small glaciers, ice caps and Greenland would account for most of the rest. The Antarctic, they believed, would actually provide a small net reduction in sea levels, with increases in snowfall more than enough to outweigh the effects of melting. They predicted an overall sea level rise of between 0.18 and 0.59 meters, with most of the uncertainty arising from different assumptions about what the world economy will do. This graph, taken from Skeptical Science, shows Isabella Velicogna’s estimates of the mass of the Greenland ice sheet. Unfiltered data are blue crosses. Data filtered to eliminate seasonal variations are shown as red crosses. The best fit by a quadratic function is shown in green. The data came from the Gravity Recovery and Climate Experiment satellites—or GRACE for short: a remarkable project to measure small variations in the Earth’s gravitational field from place to place with extreme accuracy. I. Velicogna, Increasing rates of ice mass loss from the Greenland and Antarctic ice sheets revealed by GRACE, Geophysical Research Letters, 36 (2009), L19503. Eric Rignot et al, Acceleration of the contribution of the Greenland and Antarctic ice sheets to sea level rise, Geophysical Research Letters 38 (2011), L05503. Satellites and radio echo soundings measure ice leaving these sheets, while regional atmospheric climate model data can be used to estimate the amount of snow being added. The difference should be the overall loss of ice. Graph a is Greenland, graph b is Antarctica and graph c is the total of both. These graphs show not the total amount of ice, but the rate at which the amount of ice is changing, in gigatonnes per year. So, a line sloping down would mean that the ice loss is accelerating at a constant rate. By fitting a line to satellite and atmospheric data, Rignot’s team found that over the last 18 years, Greenland has been losing an average of 22 gigatonnes more ice each year. Antarctica has been losing an average of 14.5 gigatonnes more each year. But also note the black versus the red on the top two graphs! The GRACE data is in red. The other approach is in black. They match fairly well, though of course not perfectly. That ice sheets will dominate future sea level rise is not surprising—they hold a lot more ice mass than mountain glaciers. What is surprising is this increased contribution by the ice sheets is already happening. If present trends continue, sea level is likely to be significantly higher than levels projected by the United Nations Intergovernmental Panel on Climate Change in 2007. Indeed, most recent estimates of sea level rise take Greenland and the West Antarctic Ice Sheets into account as significant factors. W. T. Pfeffer, J. T. Harper and S. O’Neel, Kinematic constraints on glacier contributions to 21st-century sea-level rise, Science 321 (2008), 1340-1343. S. Jevrejeva, J. C. Moore and A. Grinsted, How will sea level respond to changes in natural and anthropogenic forcings by 2100?, Geophysical Research Letters 37 (2010), L07703. The authors say their estimates are in line with past sea level responses to temperature change, and they suggest that estimates based on ice and ocean thermal responses alone may be misleading. With six different IPCC radiative forcing scenarios they estimate a sea level rise of 0.6–1.6 meters, and are confident the rise will be between 0.59 and 1.8 meters. Worldwide, the NRC Climate Stabilization Targets report estimates that a 0.6 meter sea level rise would displace 3 million people and raise the risk of flood for millions more. Recall that they estimated 0.6 meters sea level rise by 2100 with no melting of Greenland and the Antarctic. Statistical data on the human impact of sea level rise is scarce. A study in the April, 2007 issue of Environment and Urbanization reports that 634 million people live in coastal areas within 30 feet (9.1 m) of sea level. The study also reported that about two thirds of the world’s cities with over five million people are located in these low-lying coastal areas. A sea-level rise of just 400 mm in the Bay of Bengal would put 11 percent of the Bangladesh’s coastal land underwater, creating 7 to 10 million climate refugees. Actually it shows what would happen if the level of various bodies of water rose. So, for example, it shows what the Caspian Sea would look like if its level rose, even though this is a lake whose level would be unaffected by sea level rise. See also Greenland ice sheet. IPCC Third Assessment Report, Climate Change 2001: Working Group I: The Scientific Basis, Table 11.3: Some physical characteristics of ice on Earth..
Sebastian H. Mernild, Glen E. Liston, Christopher A. Hiemstra, and Jens H. Christensen, Greenland Ice Sheet Surface Mass-Balance Modeling in a 131-Yr Perspective, 1950–2080,J. Hydrometeorology 11 (2010), 3–-25. the ice loss, which has been well‐documented over southern portions of Greenland, is now spreading up along the northwest coast, with this acceleration likely starting in late 2005. S. A. Khan J. Wahr, M. Bevis, I. Velicogna and E. Kendrick, Spread of ice mass loss into northwest Greenland observed by GRACE and GPS, Geophysical Research Letters 37 (2010). The melting of ice sheets is not a constant, but accelerating with time, i.e., that the GRACE observations are better represented by a quadratic trend than by a linear one, implying that the ice sheets contribution to sea level becomes larger with time. In Greenland, the mass loss increased from 137 Gt/yr in 2002–2003 to 286 Gt/yr in 2007–2009, i.e., an acceleration of −30 ± 11 Gt/yr2 in 2002–2009. Matthew B. Lythe and David G. Vaughan, BEDMAP: A new ice thickness and subglacial topographic model of Antarctica, Journal of Geophysical Research 106 (June 2001), ???. Large parts of the WAIS sit on a bed which is below sea level and slopes downward inland. This slope, and the low isostatic head, mean that the ice sheet is theoretically unstable: a small retreat could in theory destabilize the entire WAIS leading to rapid disintegration. However, current computer models do not include the physics necessary to simulate this process, and observations do not provide guidance, so predictions as to its rate of retreat remain uncertain. Jenny Hogan, Antarctic ice sheet is an ‘awakened giant’, New Scientist, February 2, 2005. Linda Capper, West Antarctic ice sheet: Waking the sleeping giant?, Symposium, 19 February, 2006. J. L. Bamber, R.E.M. Riva, B.L.A. Vermeersen and A.M. LeBroq, Reassessment of the potential sea-level rise from a collapse of the West Antarctic Ice Sheet, Science 324 (2009), 901. However, these authors claim there would be important regional variations, with the maximum increase concentrated along the Pacific and Atlantic seaboard of the United States, where the value is about 25% greater than the global mean, even for the case of a partial collapse. J. L. Bamber, R.E.M. Riva, B.L.A. Vermeersen and A.M. LeBroq,, Reassessment of the potential sea-level rise from a collapse of the West Antarctic Ice Sheet (supporting online material), Science 324 (2009), 901. Rob Young, Orrin Pilkey, How High Will Seas Rise? Get Ready for Seven Feet, Yale Environment 360, 14 Jan 2010. E. Rignot, Changes in West Antarctic ice stream dynamics observed with ALOS PALSAR data, Geophysical Research Letters 35 (2008), L12505. Data reveals they are losing more ice than is being replaced by snowfall. Total ice discharge from these glaciers increased 30% in 12 recent years, and the net mass loss increased 170% from 39 ± 15 Gt/yr to 105 ± 27 Gt/yr. The melting of these three glaciers alone is now contributing an estimated 0.24 millimetres per year to the rise in the worldwide sea level (see the article by Jenny Hogan above). E. Rignot, J.L. Bamber, M.R. van den Broeke, C. Davis, Y. Li, W. J. van de Berg and E. van Meijgaard (2008), Recent Antarctic ice mass loss from radar interferometry and regional climate modelling, Nature Geoscience 1 (2008), 106–110. In 1996 the net mass loss was 78 ± 78 gigatons/year. By 2006 this had risen to 153 ± 78 gigatons/year. Sasgen, I., Z. Martinec, and J. Bamber, Combined GRACE and InSAR estimate of West Antarctic ice mass loss, J. Geophys. Res. 115 (2010). In Antarctica the mass loss increased from 104 Gt/yr in 2002–2006 to 246 Gt/yr in 2006–2009, i.e., an acceleration of −26 ± 14 Gt/yr2 in 2002–2009. The observed acceleration in ice sheet mass loss helps reconcile GRACE ice mass estimates obtained for different time periods. The CSIRO or Commonwealth Scientific and Industrial Research Organisation of Australia has a project on sea level changes. Their report on Historical sea level changes is on our recommended reading list. A 20th century acceleration in the rate of sea-level rise, 31 January 2006. Research by Australian climate scientists has shown that global sea level has been rising at an increasing rate over the past 130 years. Using information from tide gauges and measurements from satellites, Dr John Church and Dr Neil White estimated changes in global mean sea levels since 1870. Their work, published in the science journal Geophysical Research Letters (6 January), indicates an acceleration in the rate of sea-level rise that had not been detected previously. ‘Although predicted by models, this is the first time a 20th century acceleration has actually been detected,’ Dr Church says. ‘Our research provides added confidence in sea-level rise projections published by the Intergovernmental Panel on Climate Change Third Assessment Report. There are several major “fast ice” dynamical effects that could accelerate mass loss. There is paleoclimatic evidence for abrupt sea level rise, see e.g. J. T. Overpeck et al , Paleoclimatic Evidence for Future Ice-Sheet Instability and Rapid Sea-Level Rise, Science 311 (2006) no. 5768 pp. 1747-1750. This effect is a mechanical instability of the entire ice sheet due to basal lubrication from meltwater. It is mostly mentioned in the context of the Greenland ice sheet. However, it has been argued that the Zwally effect may be self-limiting in the case of steady meltwater flow, and that a sustained acceleration in ice flow requires an increase in water input variability. C. Schoof, Ice-sheet acceleration driven by melt supply variability Nature 468 (2010) pp. 803-806. For the West Antarctic ice sheet (WAIS), the important effects are often associated with floating ice shelves. Ice shelves can disintegrate due to warm ocean water underneath, or surface melt ponds “drilling” down throught the shelf and fragmenting it. When a shelf is removed, the land ice sheet it was “buttressing”, or holding back, can slide more rapidly into the ocean. The latter is called the Larsen B scenario. Another concern is the underlying bed topography. The WAIS rests on an “upsloping”, or “foredeepened” bed, meaning that the bed slopes up toward the sea, or down toward the center of the ice sheet. There has been a debate for almost 40 years about whether ice sheets resting on such beds are particularly unstable, which is still unresolved. However, melting sea ice does change the sea level, because fresh ice becomes fresh water, which is less dense than sea water. But this effect is very small. Although there is paleoclimate evidence for abrupt sea level rise, we heard from Nathan Urban that he doesn’t know glaciologists who think that GIS or WAIS could disappear within one century. The SeaRISE project (see references below) is an attempt to determine how fast you could lose an ice sheet if all of these effects are strong. Maybe SeaRISE will get a much higher number of sea level rise with more explicit ice sheet modeling, but Nathan Urban doesn’t consider it to be probable. How much sea level rise should we expect from Greenland and the West Antarctic Ice Sheet within the next, say, 10 years? What are the best adaptive measures? Floating cities? Has there been a time in history when the sea level was significantly higher than today? National Oceanography Centre, Measuring sea-level rise in the Falklands, The National Oceanography Centre, 20 October, 2010. Michael D. Lemonick, The Secret of Sea Level Rise: It Will Vary Greatly by Region, Yale Environment 360, 22 March, 2010. Michael D. Lemonick, Understanding Sea-level Rise and Variability, book based on the World Climate Research Programme workshop on Understanding Sea-Level Rise and Variability held in Paris in 2006, CSIRO, expected release Sept. 2010. NOAA’s Arctic Report Card provides recent data for changes in Arctic atmosphere, sea ice, ocean, land, Greeenland, temperature and biology. The SeaRISE project is attempt to get an upper bound from state of the art ice models. Abstract: We propose a simple relationship linking global sea-level variations on time scales of decades to centuries to global mean temperature. This relationship is tested on synthetic data from a global climate model for the past millennium and the next century. When applied to observed data of sea level and temperature for 1880–2000, and taking into account known anthropogenic hydrologic contributions to sea level, the correlation is >0.99, explaining 98% of the variance. For future global temperature scenarios of the Intergovernmental Panel on Climate Change’s Fourth Assessment Report, the relationship projects a sea-level rise ranging from 75 to 190 cm for the period 1990–2100.